The Mary River Project is located approximately 20 km SSW of Halls Creek and is easily accessible via the Great Northern Highway and the Tanami Road. Mary River is approximately 20 km from the Nicolsons processing plant. The tenement encompasses the majority of the historical Mary River Goldfield which is approximately 15 km long and 3 km wide. The area has a mining history dating back to 1885 with a large number of small-scale hard rock excavations, along with eluvial and alluvial mines having operated during the areas history. Large scale alluvial mining was undertaken as recently as the 1980’s. Despite the long mining history in the area, Mary Creek remains largely un-explored by modern techniques. Few deposits have been drilled, and where drilling has been undertaken, it has been extremely limited. Pantoro achieved immediate success from its maiden drilling program at the Mary River Gold Project. 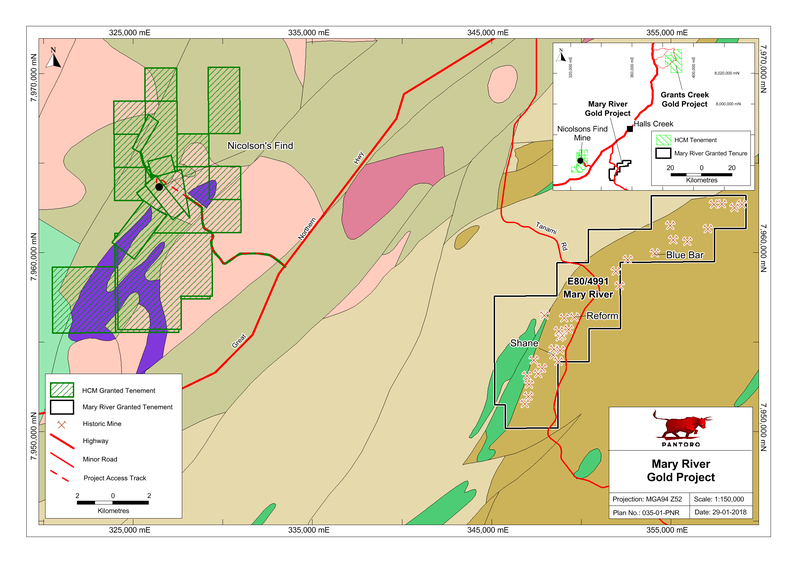 The Mary River Gold Project is centred around the historic Reform mine located approximately 20 km SSE of the Nicolsons Gold Project. Results from the maiden drilling program were announced to the ASX on 7 August 2018. The maiden drilling was focussed around the historic Reform mine which official figures show produced approximately 6.5 kg of gold (209 ounces) in the late 1800s. A further 2,300 ounces of gold was reportedly produced from alluvial workings during the 1980s. Sampling of the Reform workings in the 1930s recorded grades from 0.3 to 13 g/t Au. Minor drilling at Reform produced a best result of 8 m at 5.84g/t Au from 16 m (MRPH1). An Alluvial plant was commissioned during October 1988 by Roebuck Resources to mine a bulk sampled resource of >100 000 bank cubic metres in the uppermost reaches of the Mary River. An assessment was also made of downstream gravels in the Mary River, tributary streams and alluvial deposits and areas delineated for further bulk sampling ahead of mining. The Reform prospect is located in the Eastern zone of the Halls Creek orogeny, comprising low to medium grade meta‐sedimentary and meta‐igneous rocks of the c. 1880–1840 Ma Halls Creek Group.